A hill resort inherited from the French, lush Ba Na (per person 10,000d, per motorbike/car 5000/10,000d) has refreshingly cool weather and gorgeous countryside views. Established in 1919, the resort area once held 200-odd villas, but only a few ruins remain. Until WWII the French were carried up the last 20km of rough mountain road by sedan chair, but now a 5km (the world’s longest) cable car system has really opened up access. 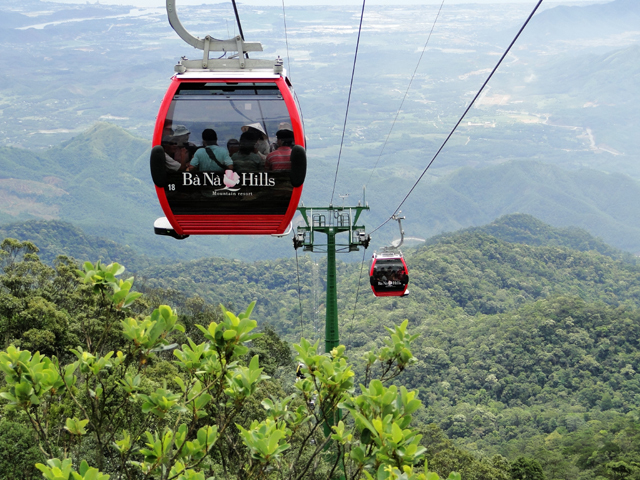 The ride involves a rise of almost 1300m, a truly spectacular trip over dense jungle. However, be warned that a tourism boom has resulted in a lot of ugly construction (and a serious garbage problem) once you get to the hill top, including a castle-like theme park. Take an extra layer or two whatever time of year you visit – when it’s 36°C on the coast, it could be 15°C on the mountain. Cloud and mist also cling to the hill top, so if you can, try to visit on a clear day. Mountain tracks lead to waterfalls and viewing points. Near the top is the Linh Ung Pagoda (2004) and a colossal 24m-high white seated Buddha that’s visible for miles around. There’s an ATM at Ga Suoi Mo, the (lowest) cable-car station. Up on the hill you can change money at the hotels. As all hotels at the hill station are poor value for money, it’s best to see Ba Na on a day trip. Ba Na is 42km west of Danang. By far the best way to get to the hill station is via the new cable-car link (return 400,000d), which is in two sections. There’s a cafe at the central station, with poor, overpriced food. You might get stuck for a while waiting for the second leg of the ride. Note that the service can be suspended during heavy wind. Otherwise you can access Ba Na via a beautiful, very steep winding road that is tough unless you have a powerful motorbike. Locals offer rides for around 100,000d.